Experience the Gold Coast at high speed with a jet boat ride. Travelling at speeds of up to 80 km/h you will feel the wind in your hair and have loads of fun. 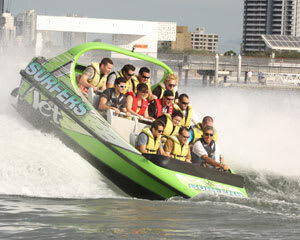 Experience Surfers Paradise at high speed with a 8.5 litre V8 jet boat ride. Traveling at speeds of up to 80 km/h you will feel the wind in your hair and have loads of fun. As the jet boat roars out of Surfers Paradise, the vessel turns north and thunders past the palatial elegance of Versace Hotel, Sea World and The Spit. As the engines blast into high powered action the jet boat flies across the water as speeds of up to 80 kilometres per hour. Experience fish tails, wave surfing, beach blasting, massive sideward slides and incredible 360-degree spins, on the Gold Coast’s most powerful jet boat. Weaving around Wavebreak Island and across the Gold Coast Seaway, the jet boat executes a quick spin and a slide before blasting along the fringe of pristine white beaches as it heads down the Western Channel. Your jet boat ride is 60-minutes of non-stop excitement and thrills. Each jet boat ride can take up to 14 passengers. This is Gold Coast entertainment at its best! Please bring your confirmation email with you on the day of your Jet Boat Ride – no confirmation, no ride. Passengers may get wet and are advised not to carry valuable property with them during the ride. David(owner/operator) of jet boat surfers was fabulous . Friendly with a great sense of humour ,competent driver ,we felt safe while participating in this activity . Thoroughly enjoyed the ride . Mum purchased through FylBys points and gave as gift. Awesome. The pilot was a former boat racer himself. He knew his trade well. The boat was light and super super fast. ***THIS IS THE RIDE OF YOUR LIFE. *** You will not have the time to blink. And YOU are WET WET WET. The only issue was trying to redeem the vouchers for 8 family members via the web. There should be a section that you can do this to ensure we were all on the same boat. The only option now is to fill out 8 individual redemptions which risked us not enjoying the ride together. Eventually I called and got it done. Loved every minute of the boat ride! Was excellent thrill can't believe I hadn't done it before now would live to put on my annual things to do ?? Robyn and Dave from Surfers Jet were great! The V8 jet boat people are pleasure to talk to and took very good care of us to make this adventure a long lasting memory. It was a fantastic ride .